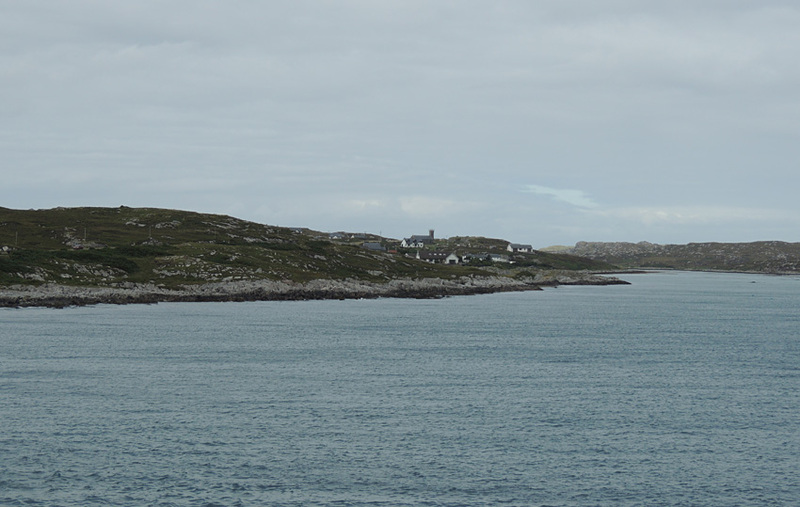 Coll is at first acquaintance a barren island, its bare ribs of Lewisian gneiss bringing to mind the low, rocky hill country of Sutherland. On closer acquaintance however, the island's great beauty is revealed... the beaches of Coll's west coast are arguably the finest in the Hebrides. 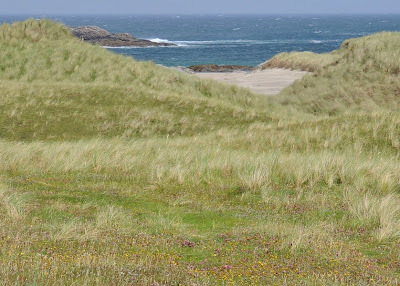 Although Tiree is fringed with long, wide beaches of finest shell sand, they perhaps lack the character of those on Coll. 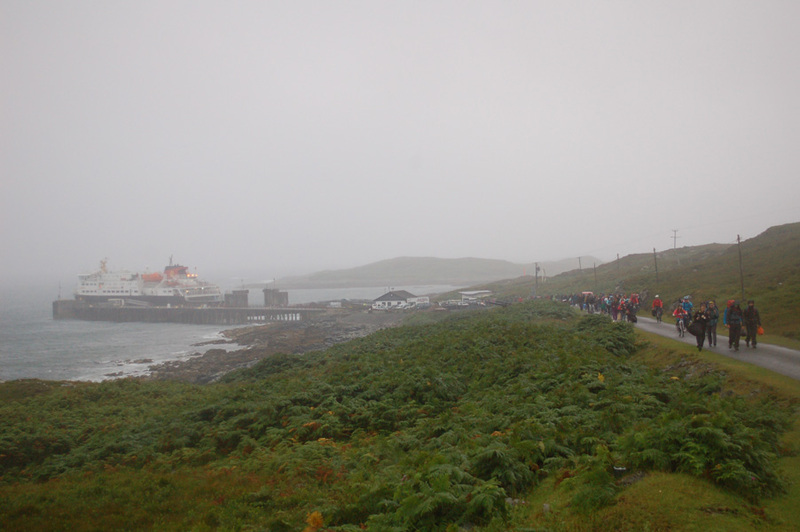 I was soon to discover the beauties of Coll for myself, thanks to the Coll Half Marathon. At 5:30am on Saturday morning we rose and broke camp near Oban. Feeling rough after the previous night, I settled down to catch some sleep on the boat, chatting later with some other runners. Driving rain promised tough conditions. 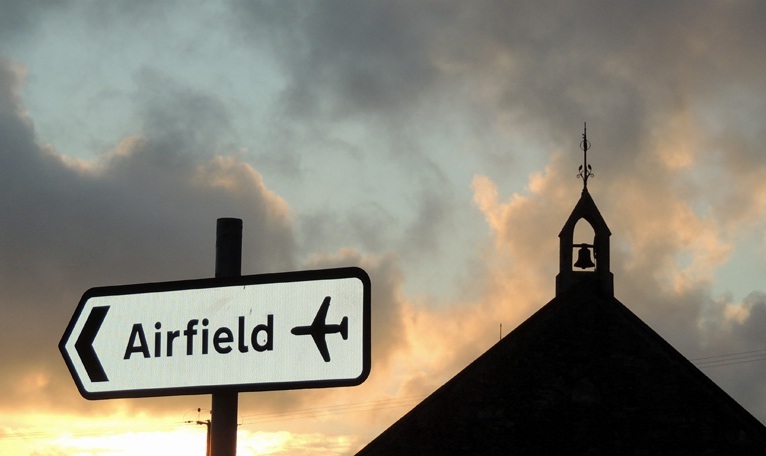 With a population of less than 200 which temporarily triples over the Half Marathon weekend, only the quick manage to book B&B or hotel accommodation, and camping is the only option for most visitors. I hoped our tent would withstand the weather. At least one tent in the makeshift campsite at the village hall didn't. Despite the weather, the organisation of the race is superb. The whole island seems to get involved. 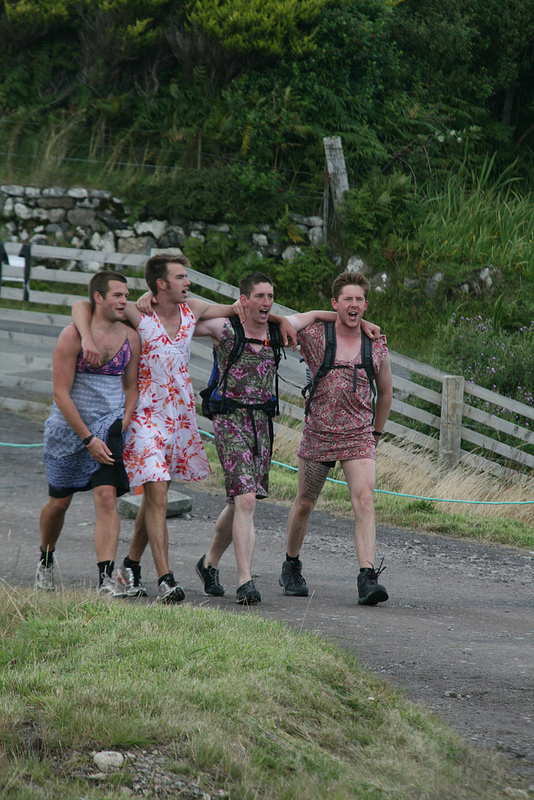 The large numbers of campers are well catered for, with access to the toilets and showers in the village hall. There was a beer tent and a BBQ. We had no food, so booked dinner in the Coll Hotel (locally caught lobster and langoustines), bought a sandwich in the shop, and browsed a small stall of local jams and chutneys. Children ran about the village, shouting 'cupcakes 50p!'. The rain stopped two minutes before the race started - perfect timing! The wind remained for the rest of the weekend, but I wasn't complaining - rather a gale than midges. It was a tough course, steeply undulating throughout with an off-road section, but this added interest, along with clearing views of the Treshnish isles. Locals in fancy dress handed out water, jelly babies - and a group of young men in dresses offered whisky to anyone foolish enough to accept. (And yes, I did.) The finish line is at the bottom of a hill, making it easy to coast over the line without appearing to be making too much effort for the crucial ticker tape photo - though I had cramped up in the last mile and hobbled home suffering. After a shower, drink and dinner (we talked to the man who won the 13 mile walking race with an impressive time of 2hr 20mins), a ceilidh was put on in the hall, jammed to the rafters, a sweatier event than the race. We left the dance for a few more sociable pints in the hotel and returned in time for a hooligan's jig. Drunk and knackered, I was pleased just to be able to stay on my feet. Next morning I was surprisingly supple - perhaps the ceilidh had worked some magic? We cycled round the island, looking at a superb beach and visited the castle, chatting to other runners from the day before. We had arrived on Coll strangers, been through a shared experience, and left as vague acquaintances. 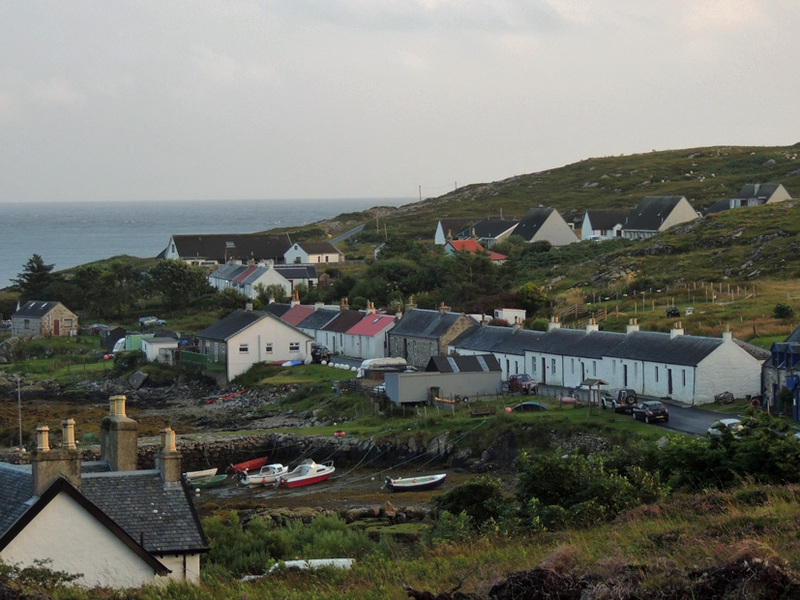 This is a huge attraction of an island race, where you have the time and space to interact with people, something you don't get from a big, anonymous event like the Edinburgh Half Marathon or Great North Run. 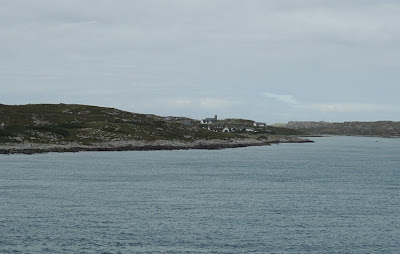 Getting to and from Coll is a bit of an adventure, and the little I saw made me want to stay longer and see more, see if the claims in the SMC guide stand up. Next year, perhaps? The return to Oban was far more interesting than the outward trip, with basking sharks, porpoises, and views of Rum, Eigg and Skye beyond Ardnamurchan. one uses the guide to select the route not to be followed, thus avoiding ninety percent of the mountain traffic. The nature of the landscape here results in heather and pebble-strewn plateaus and rounded ridges, with a break from the scrambling other Scottish ranges require. However, the lumpy tussocks and high heather can make walking strenuous even at lower levels. I am not sure I want lumpy tussocks and a break from the scrambling! There is no doubt the Perthshire hills make up for their lack of ruggedness it in terms of wildlife, but there is no need to remind potential purchasers that Perthshire is not Torridon. The other criticism concerns the book's maps. Often several routes are combined on one map. You flick back and forward trying to remember if the map for the route is ten pages later or ten pages before - one map per route would be preferable, though of course this would reduce space for more routes. And as several routes are combined on a map - often, as described before, unconventional routes - they merge into each other, which makes them hard to follow. So what is the book like to use in the field? I've often admired Craig a Barns above Dunkeld from the A9 but never stopped, so decided to try out a route I'd not done before that might give good views of it - a circuit combining several local marked trails over the viewpoint of Birnam Hill, through the pretty villages of Birnam and Dunkeld, past the waterfall at the Hermitage and the banks of the Tay. This is right on the edge of the Highlands, an area of mixed landscapes, and one my Munro-bagging earlier self had no interest in. Ronald recommends starting from the quarry car park above Birnam and so we arrived in scorching midday heat, ready for a sweat up Birnam Hill's steep forest track. The trees were flourishing in the heat, and above on a hot, dusty track - just as I mentioned that this looked like perfect adder country - we saw an adder! 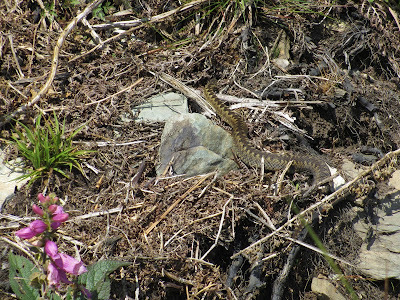 We were fortunate to see it slither back out from the trackside undergrowth and up the banking, in and out of its holes. A one-legged cricket landed on the path. Had it had a lucky escape, its other back leg removed by a frog or adder? 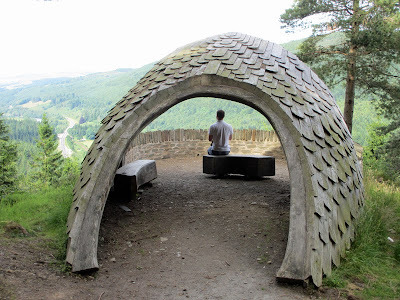 On the top a sizeable cairn can be sat on, Shiehallion sharp above a horizon-filling windfarm, the Lowlands and Lomonds shimmering in a southerly haze and trees blocking much of the view north. 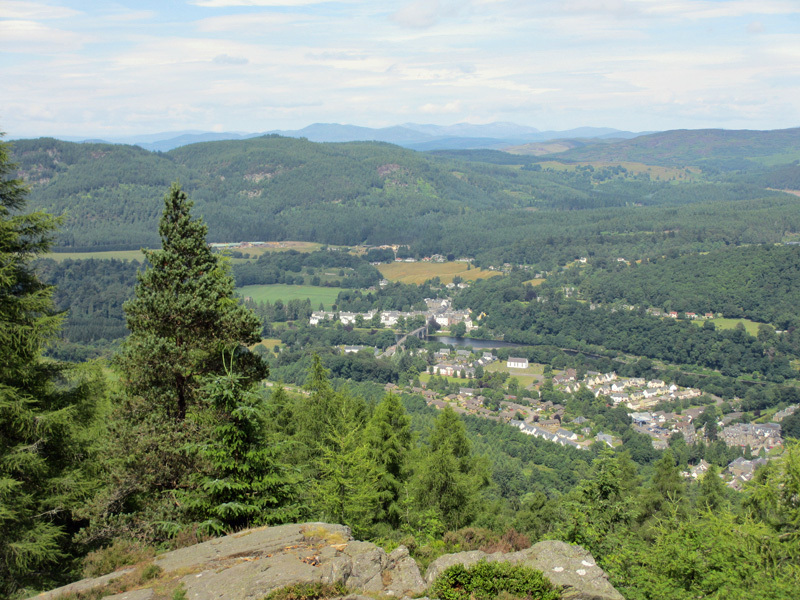 However further down the path, a rock provides a view onto Dunkeld, Birnam, Loch of the Lowes, and distant Beinn a Ghlo, with Craig a Barns less conspicuous here than from the A9. Navigation was slightly complicated along forest trails to the Hermitage (one reason for doing this route - it tested the route description). Somewhere after the Inchewan Burn the directions went awry, but not seriously, and it was obvious which route to take. We ended up at the Hermitage, full of holidaymakers, swimmers in river pools and not much water in the River Braan. How much finer this place is in autumn spate! There was also an amplified voice echoing round the hillsides, as an international mountain bike championship was taking place. 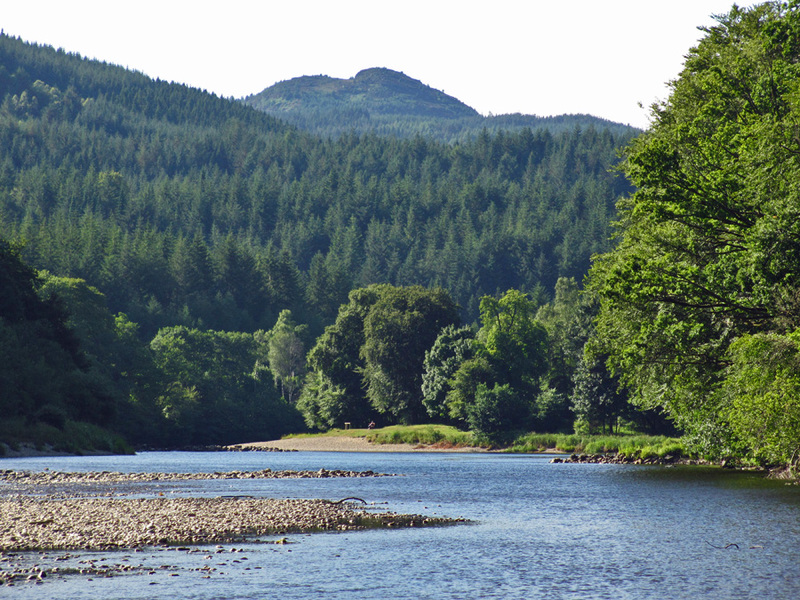 We headed on through this throng, and up to the well-signposted Pinecone Point, before reaching the Tay at the A9 roadbridge. One of the unexpected features of this walk was the traffic noise on the A9, so it might be better done out of season or during a weekday. 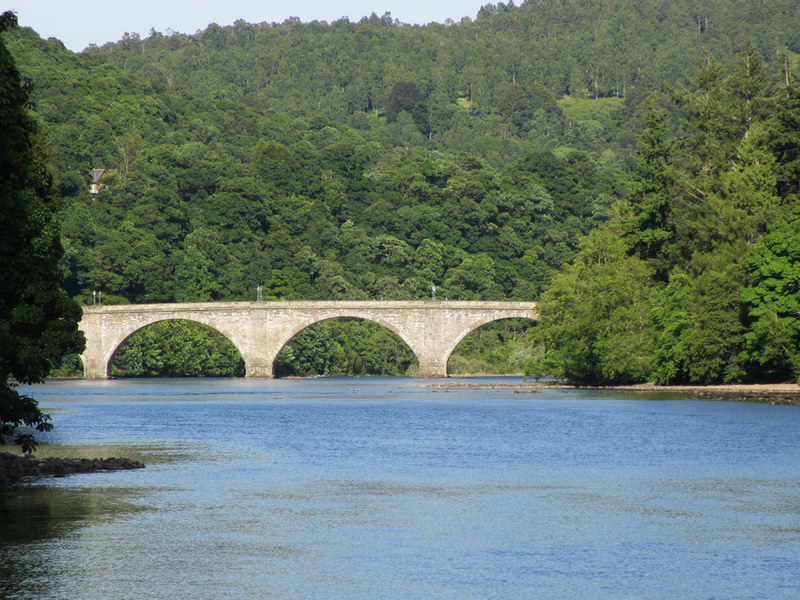 It was a relief to cross under the A9 to the banks of the Tay and leave the traffic behind. The Tay was the nicest part of the walk since Birnam Hill. Salmon parr could be seen in the shallows, warm stones in the shallows dipping into dark, deep water. The price for a day's fishing appeared on a notice near the Dunkeld House Hotel - it seemed quite reasonable! Even if you caught nothing all day, a day on the river would be compensation enough. The area is also renowned for its trees. 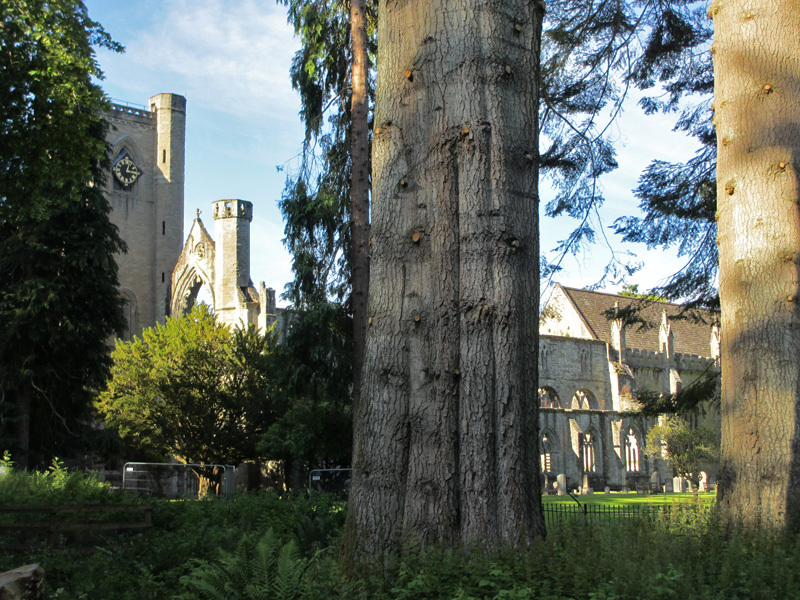 The oldest is the Birnam oak, seen after crossing the Tay bridge, home to hundreds of species of insect and other wildlife. If I were writing the guidebook, at this point, I would suggest the hot and weary walker follow the road out of Birnam for the A9, wait several minutes for a safe opportunity to cross, then a final anti-climax of a half kilometre of road tramping back to the car. What I would not recommend, though Ronald does, is to follow the Tay downstream to the Newtyle beat then head in a crazy shortcut up through nettles and trackless jungly undergrowth (we were in shorts and sandals), to find yourself on a steep banking above the busy A9, wondering how you are going to get down to the roadside. I don't know if Ronald did this route in winter, but if you read this blog post and then do this walk in summer, please ignore the final direction in the guidebook! It can take a leap of imagination to bring medieval warfare to life. There were lice, and fleas, and rats, rudimentary medical help and disgusting sanitation - but that was the lot for everyone, not just castle-dwellers. What today we would probably see as the true horrors of war would have been, to the medieval mind, life as usual. And then the folk in the olden days go and do something unexpected, something that draws you up short. 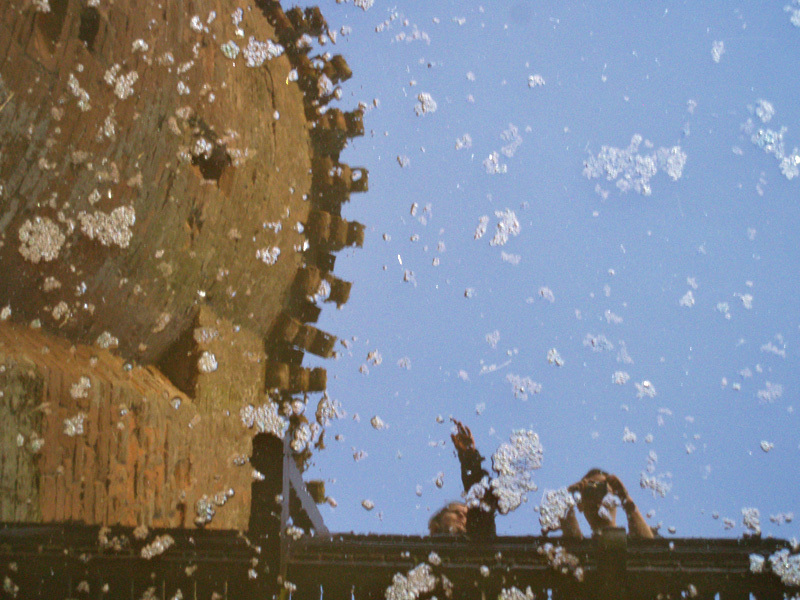 Perhaps life was not so bad in these castles? Perhaps, even, it was refined and delightful? 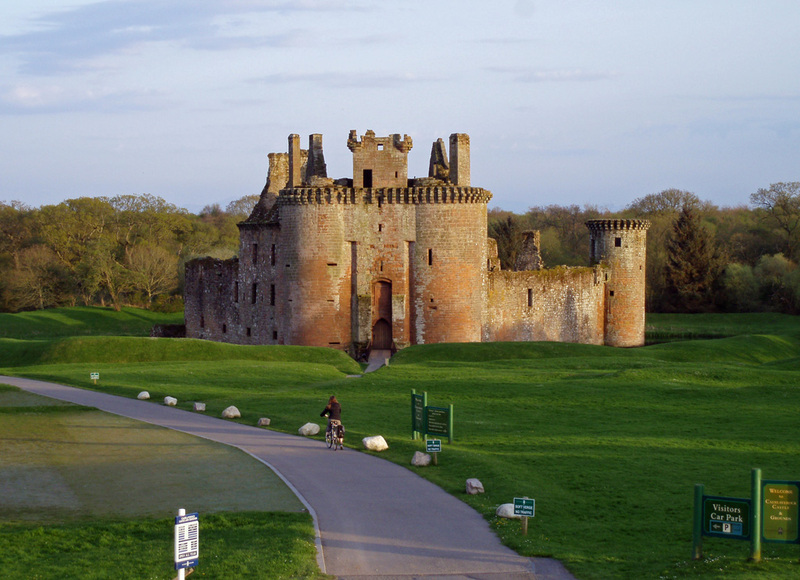 Certainly the name Caerlaverock suggests such an existence. 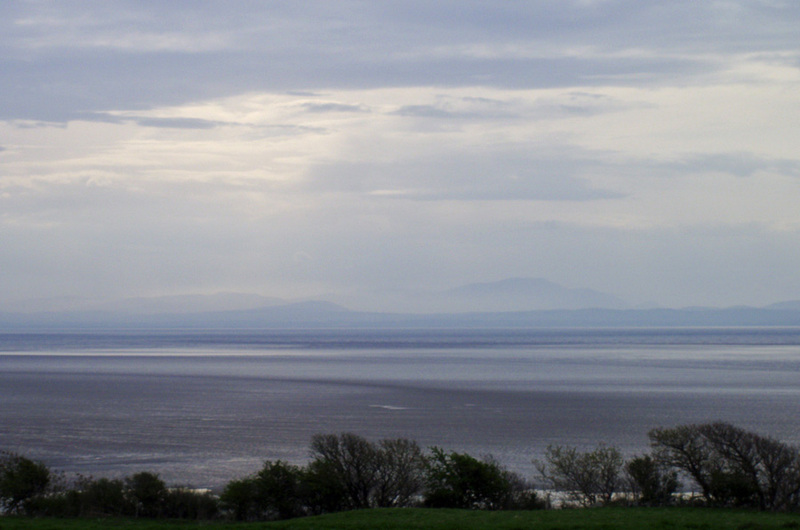 Caer Laverock. Lark Castle. It sounds more like an idyllic country cottage than a key bulwark against English invasion. Its part-Welsh name hints at a very old origin, and it was first mentioned in a charter of 1160. 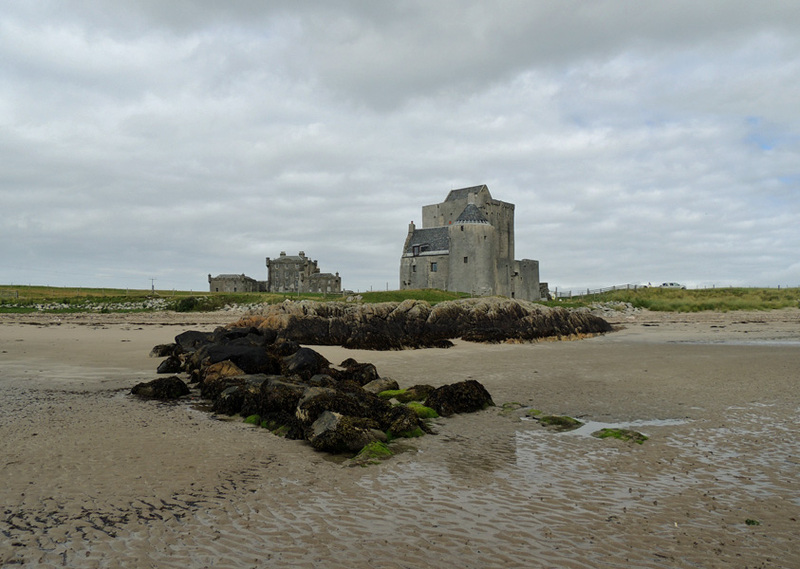 However the current castle is much newer than that - 13th century. 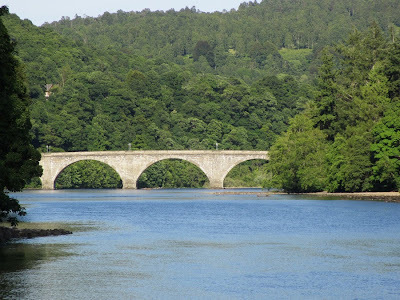 It was completed in time for Sir Eustace Maxwell, with 60 men, to hold out for several weeks in the summer of 1300 against Edward I and 87 barons of England, Brittany and Lorraine. He supported John Bailliol as king in preference to Robert Bruce, but switched to Bruce's side on Bruce's ascendancy, at which the English had another (this time unsuccessful) siege. However, following Bruce's own policy of slighting castles so they could not fall into the hands of the English, Eustace slighted his own castle, and was rewarded well by Bruce for his sacrifice. 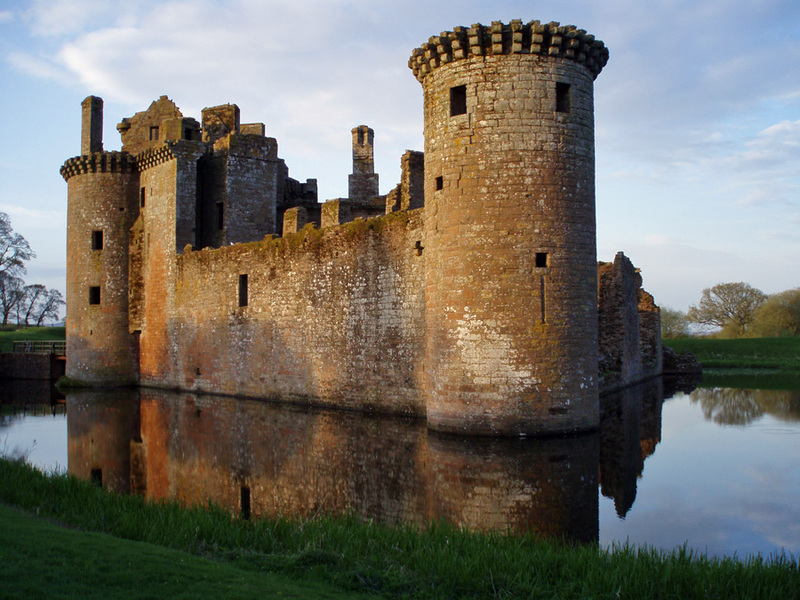 Caerlaverock is everything a medieval castle should be: accessed over a moat by a drawbridge, it has a strong gatehouse, and towers and living accomodation to explore once inside. In the surrounding parkland, life-sized replicas of siege equipment await the volunteers who re-enact seige scenes each summer. The newest part was built in the early 17th century, but by then the days of the castle were numbered. Held by the Catholic Maxwells, it was partially demolished by the Covenanters in 1640 after a 13 week siege. It has remained a picturesque ruin since. In its heyday, the castle was surrounded by the creeping waters of the Solway saltmarsh, difficult of access except by one route and thus well defended. Today the Solway marshes are half a kilometre away, and Caerlaverock's situtation - moat notwithstanding - is firmly on dry land. The marshes are preserved today as a bird reserve - we waited, and listened, but time was getting short, and we had to leave before hearing any larks. 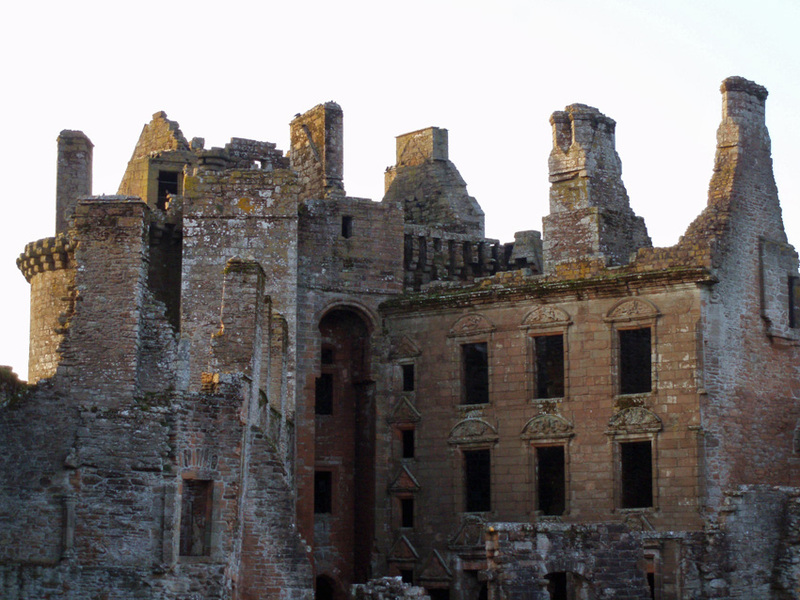 I hope they still sing their sweet song over the ruins of Caerlaverock. Waiting on the bus at North Bridge, daylight fading on an Edinburgh festival weekday, and who did I see but Thom Dibdin! There he is, in my audience!